Imerovigli is set on a clifftop, overlooking the sparkling waters of the sea. It’s on the west side of Santorini, meaning you can enjoy some of the best sunset views on the island from the comfort of your hotel. It’s home to the bright whites and brilliant blues the island is so well known for, with a range of excellent restaurants, traditional tavernas, and friendly bars to choose from. Couples will love the romantic atmosphere of the beautiful town of Imerovigli, with its narrow winding streets offering fantastic views around every corner. There is a small selection of shops where you can pick up unique items and gifts, as well as a choice of hotels with elegant décor, and 5-star facilities. If you fancy spending the day at the beach, there is a selection of three just 20 minutes’ drive away from the town, each bringing their own atmosphere and charm. 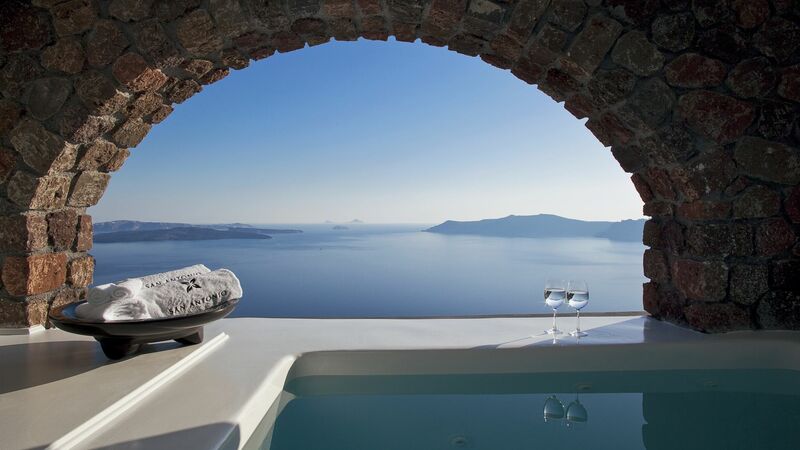 Your luxury holiday in Imerovigli is all about stunning architecture and views. There is an excellent selection of hotels, as well as traditional tavernas where you can enjoy some fantastic local cuisine. For sight-seeing there are little white churches and vineyard tours nearby, with the volcanic soil adding rich flavours and nutrients to the local wine and produce. If you want to explore further, Fira – the capital of the island is just a 5-minute drive away, there you can immerse yourself in the island's history and culture by visiting many of the museums and galleries. Book your luxury holiday to Imerovigli with Sovereign and we’ll help you make the most of your time away. Our expert Trusted Advisers will help you find the perfect hotel, whoever you’re travelling with. San Antonio is perfect for couples, with its striking views, a cliffside restaurant, onsite spa and large rooms, and the superior suite offering its own private pool. Imerovigli is one of the smaller resorts in Santorini, but it's an easy bus ride into Fira for shopping and exploring. For dinner, try Avocado Restaurant - it's a firm favourite with visitors. The flight to Santorini is around 3 hours 45 minutes from the UK. Transfer time from Santorini airport to Imerovigli is approximately 20 minutes. Like most Greek islands, Santorini’s long summer months stretch from April through to September or October. The dry, sunny spring months are warm enough for beach-going and sightseeing, and average highs top 30°C in July and August.